It’s that time of year…You know what I mean. Everything becomes pinks, yellows, greens and baby blues. Cadbury creme eggs are everywhere. M&M Easter candies. Oh peeps, we can’t forget the peeps. Well it’s no different in our kitchen. We had some leftover chocolate from a production run, so we figured why not start with the Easter fun. Now in my kitchen I prefer to temper chocolate. I love the snap and shine from the process. But in your kitchen, you may not want to temper the chocolate. I get it. It’s a difficult process to master. The ingredients won’t change depending on tempering or not. So it’s entirely up to you. If you want to give tempering a try, here is a quick video from America’s Test Kitchen on the science of tempering and how to do it. If you don’t want to bother tempering, you can just pour the chocolate into baking sheet and put it in the refrigerator to cool and set. Now here is the difference. If you temper the chocolate, you can leave this out on the counter and it won’t lose the snap and shine. If you don’t temper the chocolate, you must keep it refrigerated instead. Zero difference in taste. The process is entirely up to you. For our decorative effects, we used Wilton sprinkles and spring color M&Ms. You can use pretty much use anything you like as long as it is Easter colored. Also for ours, I split the chocolate in half and colored some with Chef Rubber cocoa butter to make it pink. They also have blues and greens. Go with color or just keep it white chocolate. Next I would recommend finding the best white chocolate you can get. White chocolate can be over the top sweet. So make sure what you use is one you like. For my bark I don’t use a lot of the decorative stuff. I like the flavor of my white chocolate. So we just use a little bit of the add ins to give it a cute look, but not overpower the taste of the chocolate. So my recipe gives you a guideline of the amount of sprinkles based on what we used, but use what you would like. Also what is great about this bark is that it makes an awesome gift. For those of you that like to make Easter baskets, this is a great piece to put in there. You can easily wrap the bark pieces up in a clear food grade bag that you can get at any Michaels or craft store and tie it with some Easter color curling ribbon. So there you go! Super simple, cute and makes a great gift. 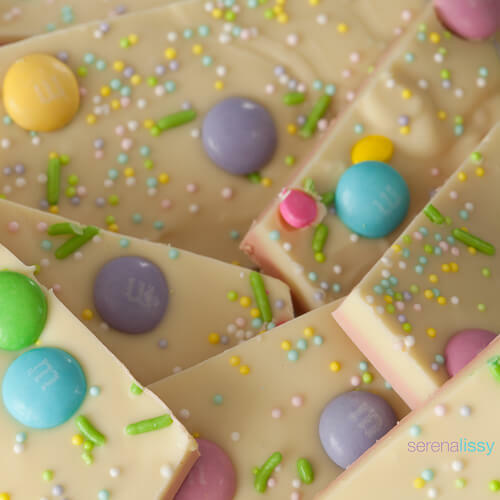 What more could you ask for from Easter bark? At this point you can temper the chocolate per the video, or if you choose to not temper, melt the white chocolate over a double boiler. Pour the chocolate into the baking sheet and use a spatula to level it out. While the chocolate is still liquid sprinkle on your M&Ms and the Wilton sprinkles. Once you have it the way you like it, you can put it in the refrigerator to set. If you have tempered, there is no need to put it in the refrigerator. Once the chocolate has hardened, lift it out of the baking sheet and place it on a cutting board. I then use a knife to cut pieces. Or you can use your hands and just start snapping pieces off. 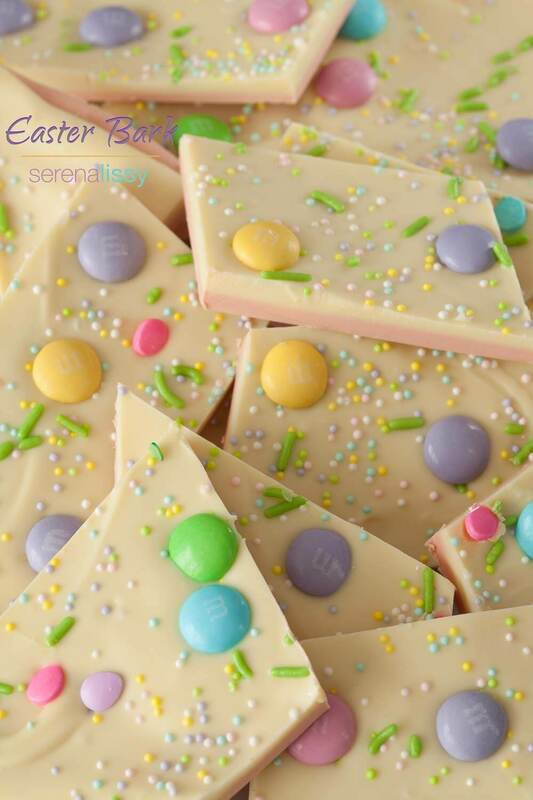 Your easter bark look delicious and so easy to make!